The Fellowship was fortunate enough to obtain a copy of CRYPTOCRACY #1 from Dark Horse Comics. Van Jensen writes, Pete Woods draws and colors, and Nate Piekos of Blambot letters. The time is now, and the world is controlled by nine families. Mars runs North America, and Grahame is a high-ranking agent there. The leader of Mars is dying, and his headstrong daughter is champing to take his place. But before that can happen, something comes out of prophecy to destroy one of the other families. And now the rest of the families are certain that it’s coming after them. Grahame is a good agent, and he really loves his job. Temple (the aforementioned heir) may not like him much, but he seems to be the kind of guy who can be counted on in a pinch. There’s a rich history built into this story, and it will be a lot of fun learning more about it. And the art is amazingly detailed, with just as much loving care in the explosions as in the intricate technologies. So let’s run down the list: cool story, witty dialogue, cool tech, fantastic art, and Gary – this is definitely going to be an epic experience. Check it out. 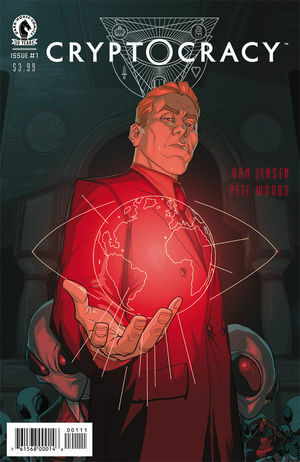 CRYPTOCRACY #1 is available now at your FLCS or at darkhorse.com.